The Research Agorà is an important forum dedicated to Research Project Consortia within the International CAE Conference and Exhibition and provides an ideal environment to present their project concepts and publicize their achievements to a wide and influential audience. BADGER will enable access to the underground space with minimum disruption, even if it contains buried objects and other utilities. It will ease the supervision process through control and automation tools. 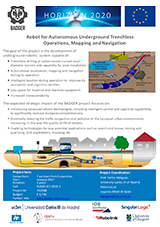 It will reduce the time and resources necessary for underground operations. 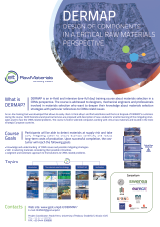 DERMAP is an in-field training program, aimed at leading industrial designers towards a more responsible materials selection process, taking into account criticality issues of Raw Materials. PARTNERS:: UNIVERSITÀ DEGLI STUDI DI PADOVA • AGH UNIVERSITY OF SCIENCE AND TECHNOLOGY • CONSELL GENERAL DE CAMBRES DE COMERC INDUSTRIA I NAVEGACIO DE CATALUNYA • CONSORZIO SPRING • ENGINSOFT S.P.A. • FUNDACIÓ EURECAT • MONDRAGON GOI ESKOLA POLITEKNIKOA J.M.A. S. COOP. (MGEP) • SWEREA AB • SWEREA SWECAST AB • ZANARDI FONDERIE S.P.A. 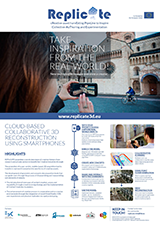 REPLICATE aims to use mobile devices and their sensors to deliver 3D reconstruction of objects and surroundings via intuitive user interfaces. The platform enables to create real-world-derived digital assets in a cooperative environment where human inspiration can be harnessed utilizing AR and VR. 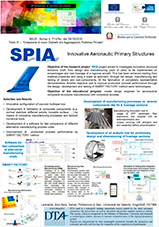 SPIA project deals with investigation of innovative structural solutions (design & manufacturing) to be implemented on empennages and rear fuselage of a regional aircraft. Another objective is to improve production process performance through development of SMART FACTORY method sand technologies. PARTNERS:: ALENIA AERMACCHI S.P.A. • DTA SCARL • AVIO S.P.A. • ENGINSOFT S.P.A. • CONSORZIO CETMA • UNIVERSITÀ DEL SALENTO – DIPARTIMENTO DI INGEGNERIA DELL’INNOVAZIONE • POLITECNICO DI BARI – DIPARTIMENTO DI MECCANICA, MATEMATICA E MANAGEMENT • SALVER S.P.A.
Funding Scheme: MIUR - Avviso n. 713/Ric. del 29/10/2010, Titolo III – "Creazione di nuovi Distretti e/o Aggregazioni Pubblico Private"
The aeronautical sector is very competitive and so the industries need to address very challenging issues in terms of performance and reliability of aircrafts and their components. 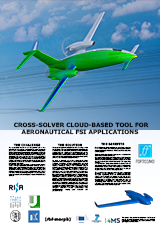 The proposed experiment aims at solving a wide range of real world aeronautical aero-elastic optimizations in a reliable and cost-efficient way by means of the RBF4AERO software platform running as a cloud-based tool on the high-performance computing (HPC) infrastructure of Fortissimo (www.fortissimo-project.eu). Users will be provided with a GUI client that runs on the users’ workstation and connects seamlessly to the HPC system to run simulations and optimizations. The continuous improvements and recent implementations in computational methodologies, modelling and simulation are deeply changing the way particularly problematic diseases (e.g. aneurism) can be studied and cured. 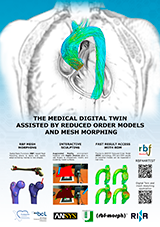 Clinical and imaging data, acquired with state-of-the-art techniques and equipment, can be used to develop specific Computer Aided Engineering (CAE) multi-physics models, which are a digital replica of the physical body (Digital Twin) useful to study both pathologies and their progress. Augmented Reality (AR) and Haptic Devices allow researchers and physicians to interactively define and apply shape modifications to model surfaces. Mesh Morphing and Reduced Order Models (ROM) enable to easily the modification and inspection of results of Computational Fluid-Dynamics (CFD) and Computational Structural Mechanics (CSM) analyses in real time. 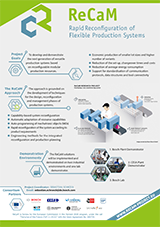 The RBF4ARTIST project aim is to develop methodologies and platform capable to efficiently join these novel technologies in order to assist the generation, management and exploitation of the Medical Digital Twin. 1. the development of technologies to the thrust reduction of costs of the production process of stiffened panels of composite material through the realization of innovative equipment that will allow a "direct" integration of stiffening elements, thus eliminating the subsequent stages of assembly of such components. 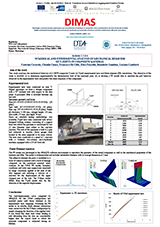 2. the development of a structural analysis platform with the aim to perform diagnosis and prognosis in the presence of structures in composite material damaged and / or defective. 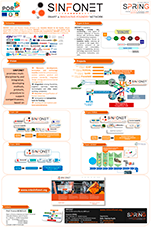 SINFONET (Innovative Foundry Network of Regione Veneto) supports competitiveness by - R&D, Innovation, technology transfer: materials, process, standards, design, resources management; -	Supply chain integration; -	HR qualification; -	Participation to Competitive Calls; - Internationalization. Partners are foundries, suppliers (alloys, consumables, engineering, technology), R&D Institutes, end-users. PARTNERS:: FONDAZIONE CENTRO PRODUTTIVITÀ VENETO • DTG, UNIVERSITÀ DI PADOVA • ENGINSOFT S.P.A. • SAEN S.R.L. • VDP FONDERIA S.P.A. • TMD DEMOTECH • RTM BREDA SRL • TMB S.P.A. • SIT S.P.A. • LINO MANFROTTO + CO. S.P.A. • LPM S.P.A. • F.A.B. SAS • MARCHETTO F.LLI S.R.L. • TECNOLABOR SRL • FONDERIE SOLIMAN S.P.A. • FIM CAST S.R.L. • UNILAB LABORATORI INDUSTRIALI S.R.L. • SAFAS S.P.A. • GSA S.P.A. • FONDERIE DI MONTORSO S.P.A. • BUSON SRL • FONDERIA PASUBIO SRL • AMS SRL • ELECTRONICS GMBH • RAFFMETAL S.P.A. • ECOR RESEARCH S.P.A. • METEF SRL • ALFIN-EDIMET S.P.A. • CONFINDUSTRIA VENETO SIAV S.P.A. • ITALKER SRL • MODELLERIA POZZAN SRL • SATEF HÜTTENES ALBERTUS S.P.A. • CESTARO FONDERIE SPA • FONDERIE ANSELMI SRL • SAV SPA • SVILUPPO FORMAZIONE SCARL • FITT SPA • FONDERIA POVOLARO SRL • MICROSERT SAS • GRIMECA S.R.L. • FONDERIA CORRA’ S.P.A. • ELKEM SRL • SLIM FUSINA ROLLING S.R.L. • ADI TOOLS SRL • RDS MOULDING TECHNOLOGY S.P.A. • ANTONIO CARRARO S.P.A.
M3-NET Precision Mechanics, Microtechnologies and Additive Manufacturing was born on impulse of the University of Padua - TE.SI. Laboratory and of Confindustria Venezia - Metropolitan area of Venice and Rovigo, is made up of 52 partners from the Precision Manufacturing Engineering sector, including 46 companies and 3 research institutes and 3 institutions. Its activities include: A widespread projects planning; Training and technology transfer; Strengthening and networking of research laboratories; Internationalization.